The Export to Video dialog box lets you export your animation as a movie file. For tasks related to this dialog box, see Exporting a Movie File . The full path and file name of the movie file to export. Opens a dialog allowing you to browse to the desired export directory and enter the desired filename. Exports all the frames in your scene. Lets you specify the frame range to export using the two input fields to the right. The first input field is for specifying the first frame to export, and the second one is for specifying the last frame to export. All the frames in-between, including the ones specified, will be exported. 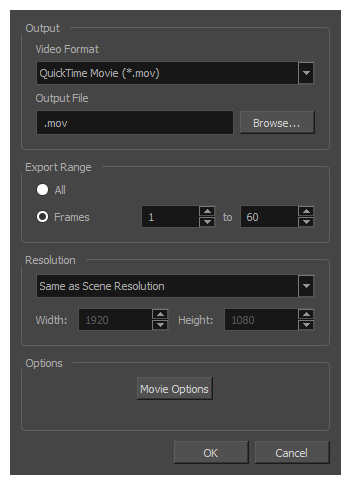 Same as Scene Resolution: Exports a movie in the same resolution as your scene's resolution. 3/4 of Scene Resolution: Exports a movie at 75% of the scene's width and height. 1/2 of Scene Resolution: Exports a movie at 50% of the scene's width and height. 1/4 of Scene Resolution: Exports a movie at 25% of the scene's width and height. Custom: Lets you specify the preferred resolution of your exported video file in the Width and Height fields below. Lets you specify the width and height of video file you wish to export, in pixels. To preserve your scene's aspect ratio, changing the value of the Width or Height field will automatically update the other field with a proportional value. Opens the movie settings dialog box for your selected video format, in which you can set the video and audio compression settings for your video file—see QuickTime Movie Settings Dialog Box and Windows Media Video Settings Dialog Box. NOTEThis button is available on Windows and macOS only. Opens the video settings dialog box, which allows you to set the video compression settings for your video file—see OpenQuickTime Video Options Dialog Box. NOTEThis button is available on GNU/Linux only. Opens the audio settings dialog box, which allows you to set the audio compression settings for your video file—see OpenQuickTime Sound Options Dialog Box.